The psalms in the Hebrew Bible have often been compared with the religious texts of Mesopotamia, Egypt and Canaan. Roger Tomes shows, in this incisive monograph, how the letters of the ancient Near East, from Mari, Amarna, Ugarit, Nimrud and Nineveh, are an equally rewarding analogue. In them we find suppliants, caught in crisis situations, appealing to their rulers; they use the same arguments to persuade them to act as the psalmists in their appeals to God: protestations of innocence, confession of faults, promises of loyalty, descriptions of plight, appeal to the other’s own interests, direct reproaches and quotation of the reproaches of enemies, and expressions of dependence. These are parallels that have much to teach us about the social position of the psalmists and their relationship to the cult. Roger Tomes was Honorary Research Fellow, Department of Religions and Theology, University of Manchester, and formerly Lecturer, Northern College, Manchester. 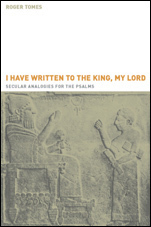 [A] valuable study, making readily accessible a whole range of ancient texts which have a direct bearing on the interpretation of the Psalms.